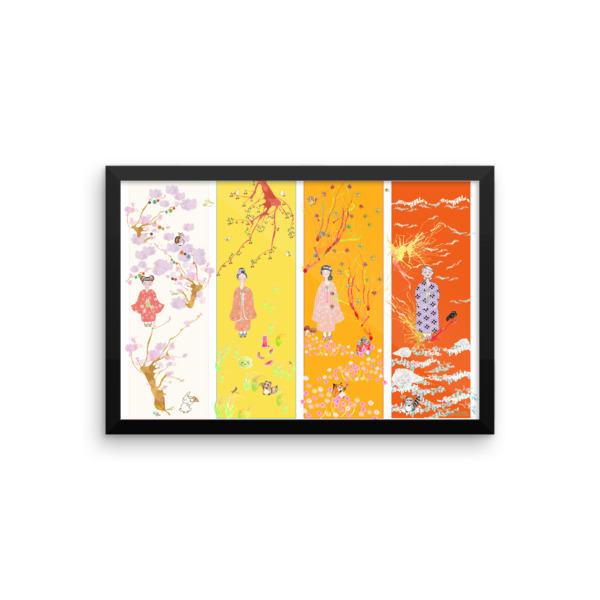 This poster is a four panels fairy tale about Kyoto. Once upon a time, a little girl would make on wish every year in a temple. In spring, during cherry blossom, she wishes to have a pet. Then, a few years later on a summer day, she wishes to have a boyfriend. After a few years, one day of autumn, she wishes to enter a good university, and get a great job after she graduates. Finally, she becomes an old lady and has to make her final wish to the temple. But this time, she doesn’t ask anything for herself: she prays for the happiness of her relatives. Kyoto is the hometown of my husband, and this is my favorite city in Japan. I like the atmosphere and the colors of this town: it feels like everything is so soft and calm. I love the season of cherry blossom in Japan, and Kyoto is one of the best place to admire it. This painting uses traditional Japanese colors for the background: I got inspired by the book colors of Japan (link) to decide which color to use. Colors in Japan have very specific names, related to Japanese nature, for this reason they are unique. This poster would be nice in a child’s room, as it is a life metaphor about growing up. The colors are very soft, with warm tones of yellow and orange. This poster is part of a series of fairy tales, “Once upon a time” around the world: check also “Once upon a time in Paris” in France, and “Once upon a time in Bali” in Indonesia. These three prints were featured in an exhibition in Kyoto, Japan, in march 2015. When they are put together, they look like a rainbow!